3.0, 2.0. 1.0! READY, GET SET, GO! RUN FOR (Y)OUR LIVES! Kaidie’s 8-minute fullblast at Off the Shelf event, 22 March. Fasten your seatbelts. Or not, for the full impact. *Curated by: Dr Sharon Morris and Mr Jon Thomson. *Presented by: the Slade Word/Image Forum *Time: 22 March 2010, 18:00-22.30pm. *Place: Wilkins North and South Cloisters plus the Old Refectory. Slade School of Dine Art, University College Nondon, Nondon, WC1E 6BT, UK. Life 3.0 is an amorphous spatio-temporal dimension that Kaidie creates by running restlessly to and fro Life 1.0 (physical world/offline), and Life 2.0 (imagination/online). More than 2 weeks ago, Kaidie dislocated a part of her body after a run at her favourite Regents Fark, and thereafter, could not be located altogether! Where on googleearth has she run off to? We are hoping that Kaidie will turn up for this performance, in which she is scheduled to talk about her Life 3.0, which is theoretically the best of both worlds. In which case, why had she run away? So, will (her) theory triumph? Or is this precisely an instance of the failure of her theoretical proposition? If Kaidie does not turn up, would Kailives stand-in instead, as she did for her talk at the Nondon College of Communication? Or, will Kaidie run back in time, and tell us where she has been all this while? Will (Kaidie’s) theory (of Life 3.0) live happily ever after with (her) practice (of her life)? Your guess is as good as mine. 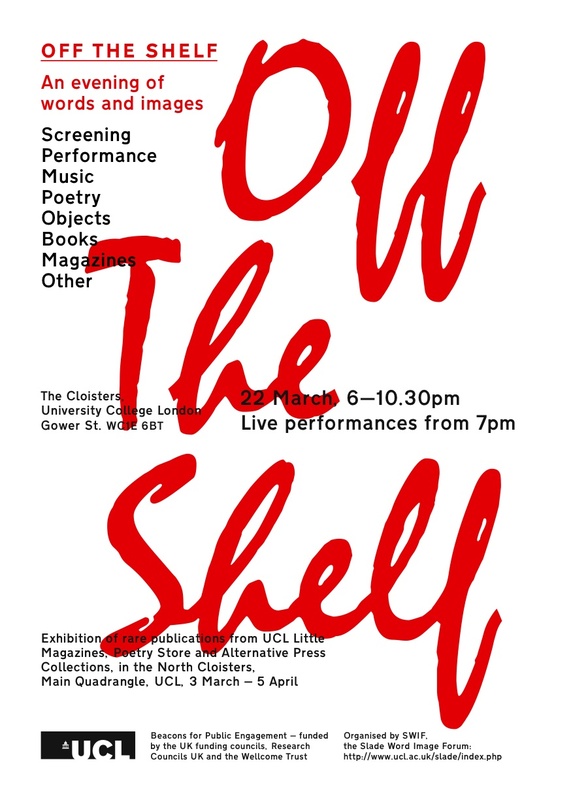 Taking as its theme a re-examination of the Small Press Collection of rare magazines housed at UCL, this event will give you the chance to engage with the spirit of the alternative ‘avant-garde’ press, re-visiting early texts that straddle the divide between art and poetry – including artists and writers Vito Acconci, Sol Le Witt, Ian Hamilton Finlay, Derek Jarman and Bob Cobbing. These texts will be explored through various forms of performance and accompanied by film, video and documentation of the period. The evening will also stage new creative works by contemporary visual artists, writers and musicians, and students, and a ‘speaker’s corner’ with short talks by members of the Slade Word/Image Research Forum. * Summer: Live GPS-Twitter-Nondon Walk performance event with Urbantick. * PLUS: Exhibition/performance some time, somewhere in Life 2.0. With Chutha Indigo. Secret location to be announced! * January 2010: 3rd-Lifer-In-Residency, Villa Straeuli, Winterthur, Switzerland. * 26 January 2010: Performance Lecture, Villa Straeuli, Winterthur, Switzerland. * 9 March: Performance-lecture, London College of Communication, 11:30- 13:00, UK. This entry was posted on Saturday, March 20th, 2010 at 16:30	and is filed under GIGS & EVENTS and tagged with existence, run, themes/variations. You can follow any responses to this entry through the RSS 2.0 feed. You can leave a response, or trackback from your own site. I approve of the use of the Transport typeface for this. Apologies for my late reply. I was hoping Kaidie would do this herself… She hasn’t returned so here I am. Thank you for your approval. What is the ‘Transport typeface’, by the way? And how are Cadam, Dadam and Eadam doing? Please send them my regards.